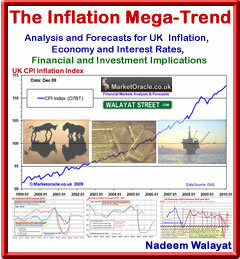 The Quantum of Quantitative Easing Inflation is Coming! And this week we have seen more convenient revelations out of the US dating back to 2007 that HSBC, Britain's biggest bank that forces ordinary citizens to jump through hoops to transfer small amounts of currency abroad has been engaged in systematic money laundering for the Mexican drug cartels to the tune $7 billion with potentially far worse across the world as HSBC affiliates apparently did business with rogue nations and terror organisations. The truth is that BOTH stories could equally apply to major U.S. Banks but U.S. politicians are choosing not to investigate / hold them to account. Compared to the master market manipulators such as JP Morgan and Goldman Sachs, the likes of Barclays is just a mere amateur. The reasons why US politicians are looking the other way are the same that UK politicians and the Bank of England have ignored the crimes of Britain's biggest banks in that the politicians are in the back pockets of the bankster's and that the truth risks shaking the confidence of an already fragile financial system. So the real story is why are U.S. politicians not holding their own thieving criminal banks to account ? One possible answer may be found in the records of campaign donations. So now in the UK, HSBC takes the lead from Barclays as Britains most criminal banking institution, the question is will Barclays fight back for the lead with something even worse? 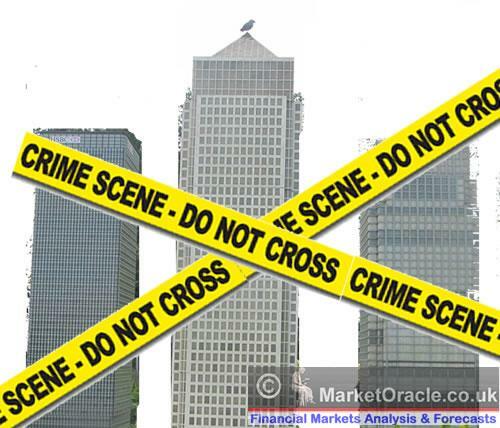 Off course Britain's banks are just a few amongst many that is the global banking mafia crime family. The truth will belatedly come out though the price paid will probably wholly be by tax payers. Now whilst you should by now be agreeing fully with me that the global banking system is fraudulent and possibly even start to see that the central banks are party to this fraud by evidence of their actions as illustrated by money printing, the whole of which has been effectively funneled into the back pockets of the Bankster elite where in the UK this stands to the tune of £375 billion over 3 years, all aided by pure propaganda that central banks are pumping money into the economy which I have repeatedly illustrated as being a PURE LIE because it has NOT been pumped into the the economy as politicians continually state but into the banks. The inflation mega-trend is something that the mainstream press never mentions as the journalists who think they are economists rely on vested interest academic economists to pump out propaganda that virtually wholly focuses on what is only the annual momentum in the rate of change of inflation as illustrated across the media by graphs such as below that paints a picture of relative stability when the truth is that of an exponential inflation trend. Quantum of Quantitative Easing (QQE) is Coming! I am quite often asked where will future inflation come from as disposable incomes are falling and my answer is that the government will ignite the wage price spiral. Then I am asked how will they ignite the wage price spiral and my answer to that is what I call the Quantum of Quantitative Easing. There is a crisis brewing and that crisis is political as a consequence of the subversion of capitalism by the mafia crime family that includes our biggest banks and central banks. You cannot shatter the illusion that has been in force for at least 60 years and probably much longer, and not face the consequences, the illusion has allowed the banks to turn everyone and everything into debt slaves, they have stolen ALL of the wealth of virtually every citizen that has debts and even those that have never borrowed a single penny as a consequence of the fractional reserve banking debt printing Inflation Mega-trend, and the consequences are going to be fought with Quantum of Quantitative Easing, which could become the big new buzz phrase in the mainstream media in about a years time, though given the 4 year delay in waking up to the LIBOR scandal it may take a lot longer still. To date the central banks electronic money printing presses have been busy for the purpose of monetizing government debt by means of the bankrupt banks. Which as I warned several years ago is likely to continue for the whole of this decade and will be one of the primary drivers of the Inflation Mega-trend and in the meantime nothing has changed this expectations. The next stage is QQE, which will involve the UK government (same applies to the likes of the US) via a number of mechanisms to directly spend money printed electronically by the Bank of England without it going through the mafia banking system i.e. direct transfer from the Bank of England to Government. The exact mechanisms used and what they will eventually be called will only become fully clear in hindsight but the basic outcome will be as I indicate here in that the Government will spend money printed (electronically) without it adding to government debt! If QE is akin to pouring petrol onto the inflation fire then QQE is akin to pouring rocket fuel onto the Inflation fire. It will result in an ACCELERATION of the EXPONENTIAL Inflation Mega-trend as the government will effectively keep writing itself blank cheque's that it cashes at the Bank of England. We are approaching the mid-point of the UK election cycle which means the coalition government will have to start to ramp up the money printing presses that will increasingly target the general public as they attempt to buy votes going into the election. The Mafia banking system is allowing the government to engage in the Quantum of QE which will increasingly allow the government to buy votes by starting to spend monopoly money (which is what Sterling will become) directly on all sorts of activities such as digging big deep holes that they will call construction projects or other measures such as tax cuts, however the key point will be that this expenditure will not have any impact on the governments budget deficit so it won't be money added to debt! They will deploy much smoke and mirrors to try and mask what they are doing and where the money is coming from. Again the consequences of QQE will be to ramp up the Inflation mega-trend, I have tried not to mention the word Hyperinflation because that is a latter stage panic event. But you are reading this at least a year ahead of the curve, at a time when mainstream press pseudo economist journalists are fully focused on the latest dip in the CPI inflation rate to 2.4%, and are eagerly regurgitating the views of vested interest academic economist propaganda of always imminent deflation. 3. Loss of confidence in Fiat Currency due increase in supply of currency and velocity of money = Hyper inflation panic event. No3 is not a certainty, it is a risk, and the more QQE a government engages in the greater will be the risk. My next in-depth analysis will attempt to map out in detail what I expect to follow over the next few years as QE continues to give way to QQE In the meantime try to immunise yourself against the worthless deflation mantra in the mainstream press, because at the moment we are experiencing the calm before the coming inflation storm.